The iTunes Store is a good source to look for audiobooks. But your choices to listen to them are usually limited because of the DRM protections on them. Audiobooks you download from the iTunes Store usually have DRM protections to help prevent them from being copied and spread. If you want to use VLC to play your iTunes audiobooks, the first barrier that stands in your way would be the DRM protection. The audiobooks you download from the iTunes Store are usually in M4B format, which is a format that are natively supported by a lot of media players like Windows Media Player, VLC and PotPlayer, but the DRM protection applied on it will prevent you from doing so. VLC is one of the most famous cross-platform media players. It’s got a large number of free decoding and encoding libraries that allows it to play different video and audio files without having to look for new codecs. It can even play encrypted DVDs on Linus and macOS with the help of a specific libdvdcss DVD decryption library. But no matter how powerful VLC is, it wouldn’t be able to play the iTunes audiobooks without you removing the DRM protections from them first. For people who want to play iTunes audiobook with VLC, an iTunes audiobook to VLC converter is needed. To convert iTunes audiobook to VLC, you should probably start out by picking a proper DRM removal tool. Most people are not familiar with such kind of tool so I’ve chosen one program for the task and I’d like to recommend that you give Leawo TunesCopy Ultimate a try. It’s a high-quality DRM removal tool bundled with 3 different modules that can perform DRM removal for common iTunes media content like music, TV shows, rental and purchased movies, audiobooks and Audible audiobooks. And after it removes DRM protection from your audiobook, it will also convert the audiobook to MP3 for you to listen to on your mobile handsets or with other media players. It’s the perfect fit for this job of iTunes audiobook DRM removal. Download and install it on your computer and learn how to use it from the content below. 1. First we will start off by importing the source iTunes audiobooks to the program. Open Leawo TunesCopy Ultimate, and when the program finishes loading, click the Add Files button on the top area of the interface. On the following file import window, find Audio Book on the left under the Library label and click on it and you will find that all your audiobooks in iTunes are listed here. The program will detect and scan your iTunes library in advance and when you try to import them to the program, it will help save you a lot of time. 2. This step is more optional than necessary. After your audiobooks are fully loaded, click on one audiobook to select it and an Edit button would appear on it. Click the button and you can change the parameters of the audiobook including Sampling Rate, Bitrate and Channel on the following popup. 3. Look down to the bottom of the file list and you would see the Output label and the output directory box. 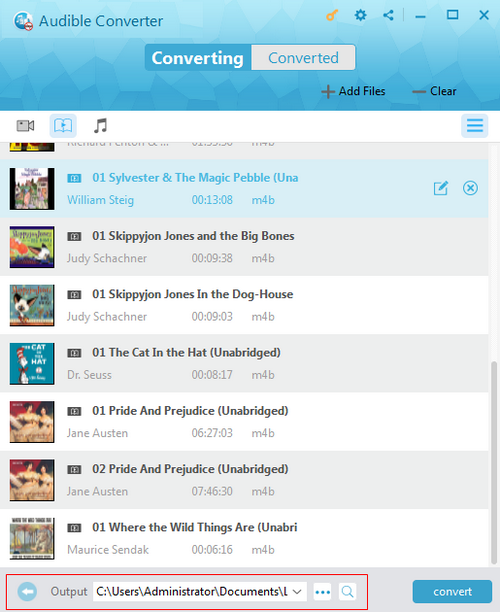 It shows where your converted audiobooks will be stored in. Click on the “…” button to change it if you need. 4. The Convert button is located in the bottom right corner of the interface. 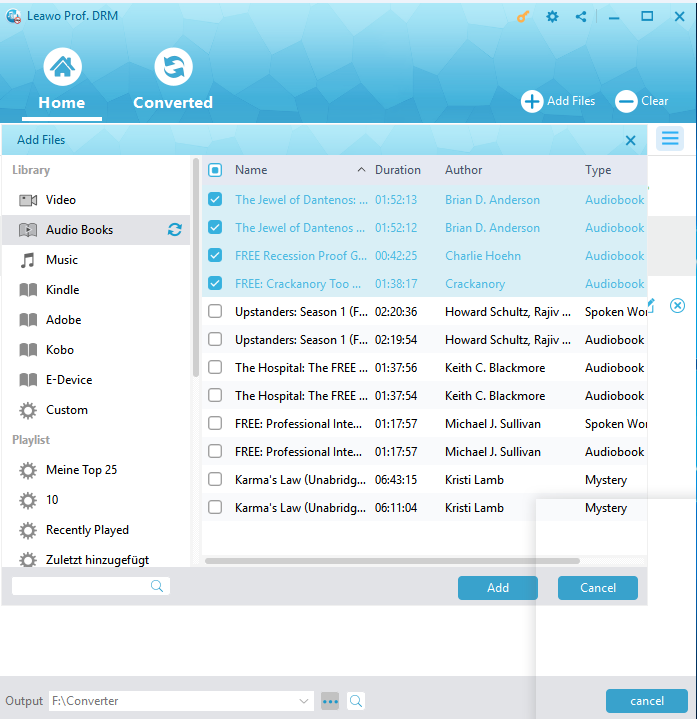 To start removing DRM and converting your audiobooks to MP3, just simply click on it. The status of the conversion of every file will be displayed on each of them. You can find the converted DRM-free audiobooks in MP3 format in the output path you set when the whole process is done. With your iTunes M4B audiobooks converted to MP3 with no DRM protection, you can now easily transfer your M4B audiobook to VLC media player for playback. After your iTunes audiobook collections are converted to MP3, you will also have the liberty to play them on your mobile handsets. For most smartphones running Android, you can just directly transfer them to the internal memory of the device and use the built-in audio player to play them. 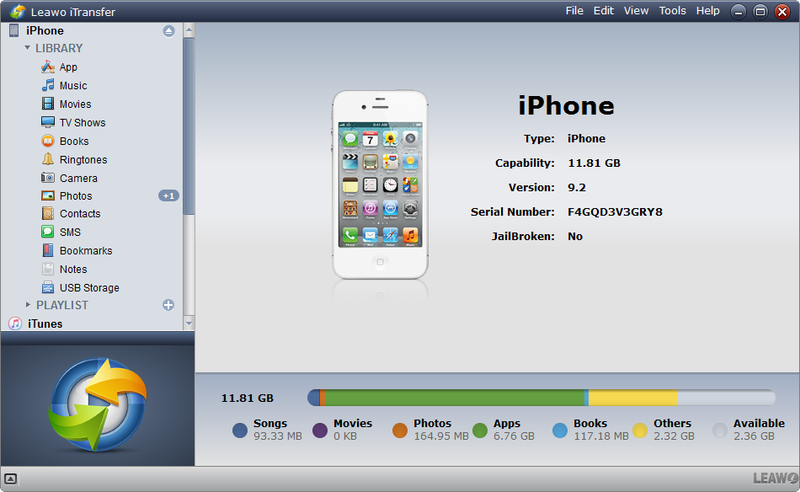 But for iPhone, the transfer isn’t that easy a task to accomplish. iTunes is the official tool for data transfer between iOS device and PC, but a lot of users have been complaining that iTunes is too complicated. 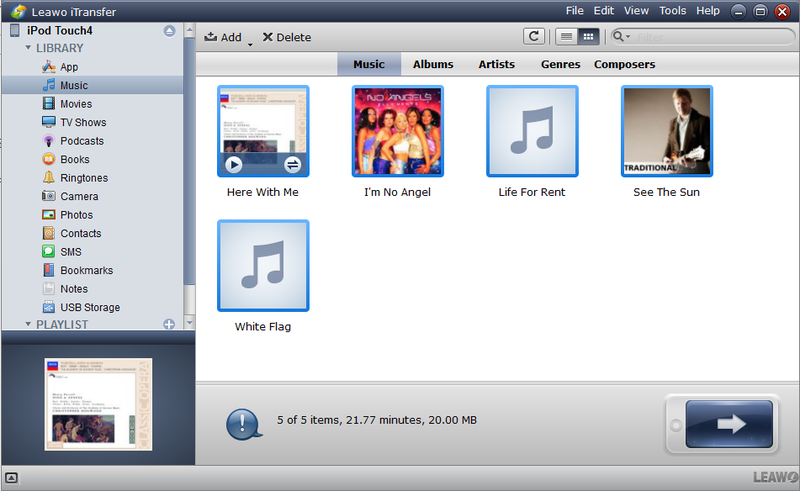 Here’s one program that you can use as an alternative to iTunes: Leawo iTransfer. 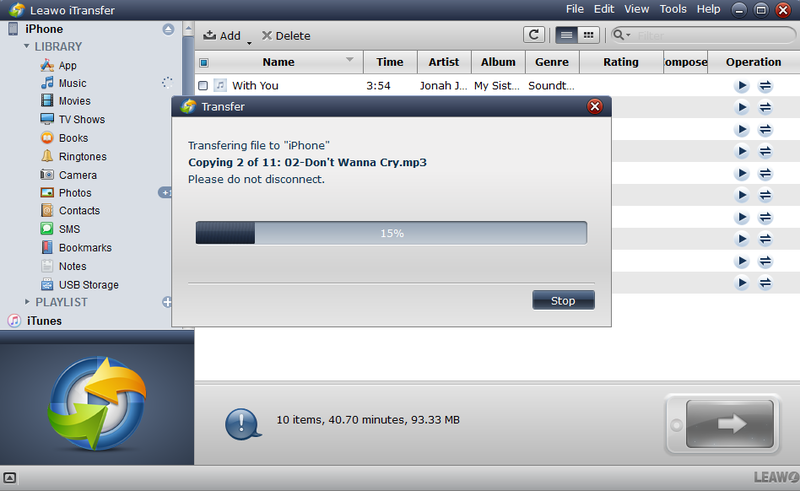 It can do all kinds of data transfer that iTunes can do and it’s much easier to use. 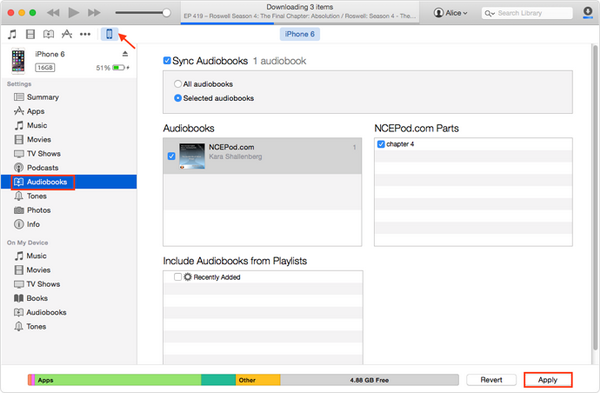 Here’s how to use it to transfer your converted audiobooks to iPhone. 1. Use a USB cable to connect your iPhone to your PC and start Leawo iTransfer. It will take a few seconds for the program to recognize your iPhone. When it does, click on the name of your device in the top right area to see more options. 2. Click on Music under the Library label and it will show you the music on your iPhone. 3. 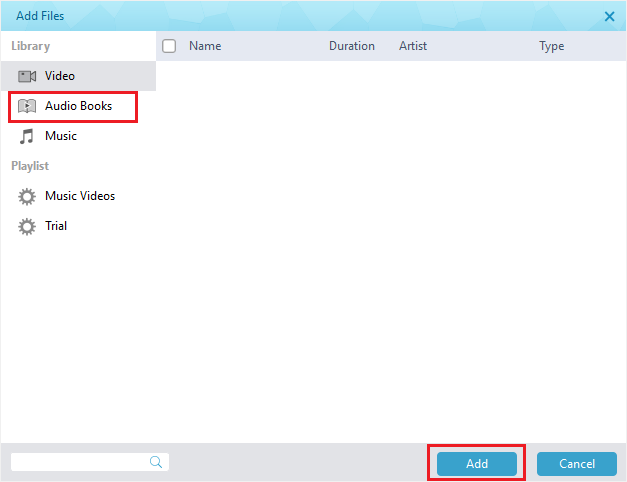 Find your converted iTunes audiobooks in the File Explorer and drag them to the music list of the program and it will start to transfer your audiobooks to your iPhone. After purchasing an audiobook on the iTunes Store, you can also directly transfer it to iPhone for listening. And it won’t require you to remove the DRM protection. Here’s how to do it. 1. Plug your iPhone in to your computer. 2. Start iTunes and click on the icon of your iPhone. 3. Select Audiobooks from the left column. 5. Select All audiobooks or Selected audiobooks. If you select Selected audiobooks, choose which audiobook to transfer to iPhone from the audiobooks list below. That’s how you can transfer audiobooks to iPhone. There are a lot of different means available. If you need, you can find more tips in this post about transferring audiobook from iTunes to iphone.